This document is a tranformation of a TEI P5 XML manuscript description incorporating images. If you have trouble reading special or non-Latin characters on this page, please make sure you have appropriate Unicode fonts installed and an up-to-date web browser. This illuminated manuscript contains two works by Sa‘dī (d. 691 AH / 1292 CE): the Gulistān (Rose garden) and the Būstān (Orchard). It was copied in 980 AH / 1572 CE by Muḥammad Riz̤ā al-Tabrīzī in Iran. The text of the Gulistān appears in the main area, while that of the Būstān is inscribed obliquely around the main text area on three sides. Both texts are written in black and gold nasta‘līq script. The margins are multi-colored, gold-sprinkled tinted or marbled paper. 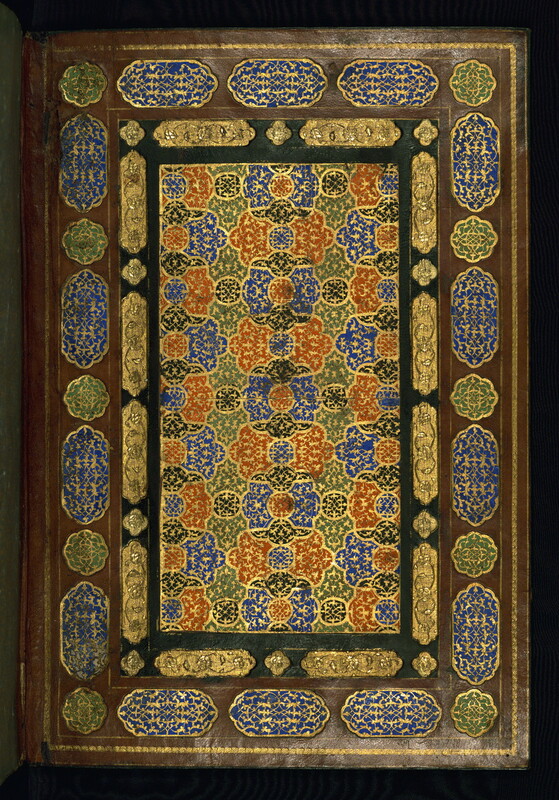 The original leather binding dates to the tenth century AH / sixteenth CE and has dentelle-style decorated boards and doublures with gold filigree work over a multi-colored ground of blue, green, red, and black. 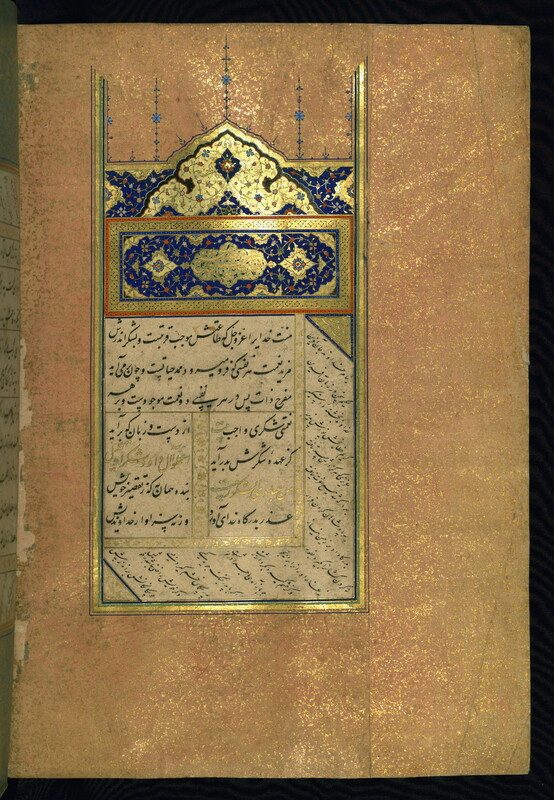 The primary language in this manuscript is Persian. The secondary language of this manuscript is Arabic. Label: This doublure of brown leather has gold-painted filigree work on a multi-colored ground. NB: As for manuscript part, this page belongs to both Kitāb-i Gulistān and Kitāb-i Būstan. Label: This is the right side of a double-page illuminated frontispiece decorated in gold and polychrome designs. Label: This illuminated incipit page bears two titles. 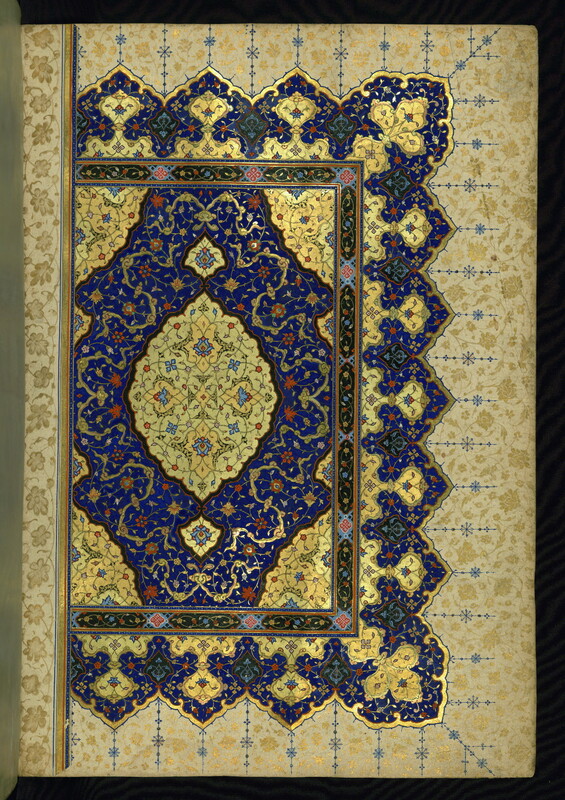 In the main titlepiece is inscribed Kitāb-i Gulistān-i Shaykh-i Sa’dī, while Kitāb-i Būstan-i Shaykh-i Sa’dī appears in the triangular sidepiece. Licensed for use under Creative Commons Attribution-NonCommercial-ShareAlike 3.0 Unported Access Rights, http://creativecommons.org/licenses/by-nc-sa/3.0/legalcode. It is requested that copies of any published articles based on the information in this data set be sent to the curator of manuscripts, The Walters Art Museum, 600 North Charles Street, Baltimore MD 21201.